The history of Burton Bradstock could not be written without reference to its illegal seafaring association. There are many legends of the activities of smugglers operating in the area, as Burton Bradstock was a key landing place at the centre of Lyme Bay. According to experts in the 19th century, "if there was any smuggling at all in south-west Dorset, the preventive officers could be sure to find it at Burton Bradstock for this had long been a noted contraband centre and official fears of a great revival in the trade there after the peace in 1815 were well-judged. Here and at Swyre, two or three miles to the east, the Northovers had a finger in every tub and provided regular employment for the keeper of Dorchester Gaol" (more about the Northovers later). The following material is largely taken from an excellent book by Roger Guttridge entitled 'Dorset Smugglers' and published by Dorset Publishing Company - sadly now out of print (see Books & Publications). We are very grateful to Roger Guttridge for giving us permission to use his book. There are two schools of thought on the rights and wrongs of smuggling, and two strikingly different definitions of a smuggler. Samuel Johnson described him as "a wretch who, in defiance of justice and the laws, imports or exports goods either contraband or without payment of the customs". Whereas Adam Smith, the eighteenth century economist and advocate of free trade, was more generous: "The smuggler," he wrote, "is a person who, though no doubt blameable for violating the laws of his country, is frequently incapable of violating those of natural justice, and would have been in every respect an excellent citizen had not the laws of his country made that a crime which nature never meant to be so." Few smugglers felt the need, or possessed the eloquence, to intellectualise about the morality of their trade but those who did used much the same arguments as Smith: the goods which they smuggled had been honestly bought and paid for, were transported at their own expense and were demanded by a wide cross-section of the public who, in many cases, could not otherwise have afforded to buy them. Adam Smith was reflecting not only the viewpoint of a select group of free-trade economists, but an ancient and deep-rooted national conviction that smuggling - the evasion of prohibitions or duties - was not truly a crime but rather a justified defence of people's rights to buy and sell as they chose, without interference from officialdom. As the infamous Hawkhurst Gang said when they broke into Poole Custom House to retrieve a cargo which had been seized: "We come for our own and will have it." It was an attitude which survived to modern times and which is now manifest in the evasion of income tax; a twentieth century official who "cheats" people out of one-third of their hard-earned cash is regarded by many as fair game for a little cheating in the other direction. In the same way, the collectors of customs in earlier times were widely regarded as legalised robbers who, at the very least, deserved a little of their own medicine. Inevitably though, smuggling, by its very nature as well as its profits, attracted the worst elements of society. Law-breakers of all kinds were among the first to jump on the contraband wagon, encouraged by the public support which smuggling attracted as well as by the prospects of adventure and financial gain. The presence of ruthless villains and ruffians in the gangs led, in turn, to violent clashes between smugglers and Revenue men and turned the cliffs and coasts of England's otherwise fairly quiet land into a blood-soaked battleground comparable with the Wild West of pre-industrial America. The history of smuggling in England goes hand in hand with the history of the Customs institution. The latter dates from Saxon times when King Ethelred II imposed a toll charge, or import duty, on boatloads of foreign wine arriving at Billingsgate. Thereafter it became a "custom" for foreign vintners to give up a portion of their cargoes in return for permission to trade - hence the origin of the term. Such tolls, however, applied only to certain ports, so evasion was neither difficult nor illegal. And the word "smuggle" itself probably dates from this period. Though primarily from the Scandinavian languages - the Danish smugle which literally means "smuggle" and the Swedish smuga means "a lurking hole" - the Anglo-Saxon smugan, "to creep", is probably cognate with the Icelandic prefix smug which stems from smjuga, and means "to creep" or "to creep through a hole". It was not until the last quarter of the thirteenth century that the gauntlet which inspired England's first true smugglers was tossed in their path: in 1275, King Edward I, seeking new sources of revenue, introduced a custom on wool exports. Wool was a mainstay of the national economy and was in great demand on the continent. To collect the duties, a permanent Customs staff was established and almost immediately the first smugglers appeared. These were known as "owlers" because their operations were largely nocturnal. As the years passed, the economic needs of monarchs increased and duties were accordingly raised or extended to other commodities; each time this happened new opportunities were presented to smugglers and another stone was laid on the foundations of the great smuggling age. Life for the early generations of smugglers was comparatively easy. It was not until the fourteenth century that the first revenue cruisers appeared in coastal waters and even then their areas of patrol were limited to ports and estuaries; for the determined smuggler, long stretches of coastline remained totally unguarded. Many, however, did not consider such diversions necessary, preferring simply to bribe the Customs officers in the ports. This was not difficult. Corruption was widespread in society generally, Customs men were poorly paid and the presence of an honest officer in a port was more exceptional than normal. One notable exception was the searcher at Poole in the mid-fifteenth century, William Lowe. He had an enormous coastal area to cover and only a horse for transport: his district stretched from West Dorset through Hampshire to Sussex, but he performed his duties with dedication and vigour and is one of the most conscientious Customs officials on record. Countless cargoes of wool and leather fell prey to his ubiquitous talons and in 1452 he seized a Dutch ship stacked high with vast quantities of goods which fifteen merchants from Sherborne, Bridport and Charminster were trying to smuggle out of the country. Lowe came to be despised by merchant smugglers and the following year was attacked by a London wool merchant, who "smote me with a dagger in the nose, and through the nose into the mouth". Lowe survived not only to tell the tale but to write a report on the incident in his own hand. 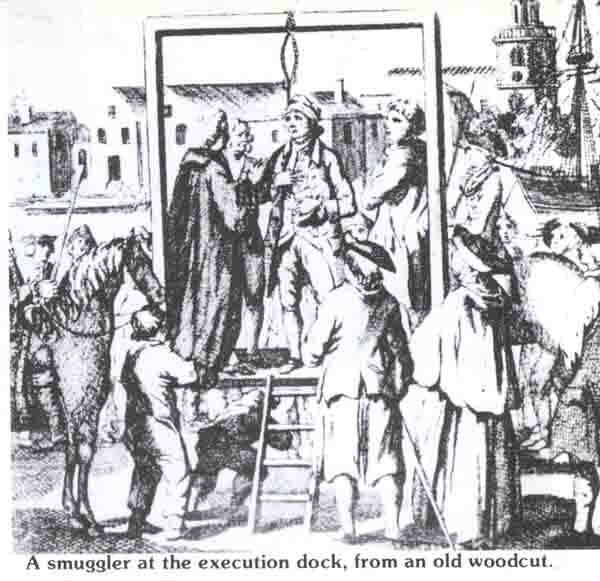 A further encouragement to the smuggler was the public support his business attracted and the favourable consideration he could expect if tried by a jury. Such was the official concern over the bias of juries that when John Roger of Melcombe Regis, a suspected wool smuggler, asked for a trial rather than pay a fine in 1428, the Privy Council refused his request on the grounds that a local jury was likely to acquit regardless of the evidence. Instead they fixed his fine at two hundred marks "or more if he can afford it"! 1700's - Smuggling gets out of hand! During the winter of 1717-18 he wrote: "the running of great quantities of goods having of late very much increased" - the government tried to push through a bill for the prevention of smuggling. It fell down in the House of Lords and, as a result, reported Philip Taylor the following April, "the smuggling trade is prodigiously increased and they and all persons concerned with them are become more insolent than ever and dares any power to oppose them, which will very soon have a very bad influence on trade. Besides, as these smugglers are generally the dissatisfied part of the country, their riding in troops of thirty or forty armed men on the least appearance of an opportunity will be dangerous to the peace of the country as well as troublesome to the Government." The smugglers even had the audacity to claim - and they used the failure of the smuggling bill as their evidence, that they were now "tolerated in smuggling by the King, Lords and Commons." "The smuggling traders in these parts are grown to such a head that they bid defiance to all law and government. They come very often in gangs of sixty to one hundred men to the shore in disguise armed with swords, pistols, blunderbusses, carbines and quarterstaffs; and not only carry off the goods they land in defiance of officers, but beat, knock down and abuse whoever they meet in their way; so that travelling by night near the coast, and the peace of the country, are become very precarious; and if an effectual law be not speedily passed, nothing but a military force can support the officers in the discharge of duties." The contraband boom continued, reaching a level in 1719 which would have been unimaginable five years earlier. In one week in October of that year, there were two runs of unprecedented size, one at Worbarrow Bay on the Purbeck coast, the other further west near Bridport. The run at Worbarrow involved no less than five ships unloading simultaneously and an observer described "a perfect fair at the waterside, some buying of goods and others loading of horses; that there was an army of people, armed and in disguise, as many in number as he thought might be usually at Dorchester fair, and that all the officers in the county were not sufficient to oppose them". In the Bridport run, a great quantity of brandy and salt was brought ashore and "carried off by great numbers of the country people" in full view of the Customs staff. Philip Taylor was not exaggerating when he reported that "the tumultuous and riotous proceedings of the smugglers is not anything abated but daily growing upon us". He went on: "Most of the smuggling trade in this country is now carried on by people in such great numbers, armed and disguised, that the officers, if they meet them, can't possibly oppose them therein, nor do otherwise than search for the goods in suspected places, which by means of the country's favouring the smugglers, very often proves ineffectual and expensive to the officers." But if they did get caught and sentenced, they could be hung! Ships of all sizes, both foreign and English, sometimes hovered off the coast for several days while gangs were organised for an illegal landing, and until the first of several "hovering" acts was passed in 1719 there was nothing the Customs men could do. If questioned by the skipper of a revenue vessel, the captains usually claimed they were bound for some place which was of no concern to the officers, such as the Channel Islands, France or Holland. The act made hovering illegal within six miles of the coast and many smugglers now found it safer to bring their goods ashore immediately and, when necessary, hide them among rocks, in hedges and ditches and coastal cottages, or even bury them on the beach. A useful alternative in the case of smuggled wine and spirits was to dump them in the sea and collect them later - a method which was to become standard practice among later generations of smugglers and which became known as "sowing the crop". In November 1720, some fishermen from Abbotsbury made an unusual catch a mile offshore near Burton Bradstock and sparked off a remarkable chain of events which ended with a question being asked in the House of Commons. The catch consisted of twenty-three ankers of brandy and two barrels of wine, which had been "moored with ropes to stones" and sunk. The casks were brought ashore at Abbotsbury and lodged at the home of the local Excise officer, a man called Whitteridge, but were then "re-seized" by William Bradford, bailiff to the Lord of the Manor, Mr. Thomas Strangways. Bradford kept the wine and spirits under lock and key for several days, claiming that his master was entitled to take them for his own use, as one of his manorial perks. The young Customs officer at Abbotsbury, Joseph Hardy, was repeatedly ordered by Philip Taylor to retrieve the goods, but when he did so, he was obstructed by a gang of locals and immediately lost them again. Taylor commented sarcastically: "They [Hardy and Whitteridge] being both the most original fools I ever met with or heard of, in the scuffle of taking the goods away I can't find any blow was struck on either side and (it appears) that the heroical officers were directly frighted out of their goods." Taylor recognised, though, that just about every person in Abbotsbury was an employee of Strangways, and he concluded that the only way to settle the matter was to call in the army, who had been ordered to help the fight against smuggling when requested. Accordingly he sent a message to Lieutenant Carr, commanding officer of Lord Irwin's Regiment of Horse quartered at Dorchester, and on November 16, Quartermaster William Thomson left the county town with Joseph Hardy and eighteen troops. On arriving at Abbotsbury, they found "a great mob of people gathering themselves about them" and Hardy summoned the parish constable and tithingman and asked them to help keep the peace. At the sight of the troops, Bradford the bailiff changed his attitude rather suddenly, handed over the keys and allowed Hardy to recapture the goods in the face of a vociferous but otherwise peaceful crowd. But this was not the end of the story. Strangways, refusing to accept defeat, later claimed that the casks of wine and brandy were not contraband at all but salvage from a wrecked ship; he also made a complaint to the Secretary at War concerning the involvement of the troops; and he persuaded one of his gentlemen friends to raise the matter in parliament but to no avail. Customs records show that in 1764 ships of the East India Company smuggled tea into this country estimated at seven million pounds annually. Tea cases were fitted between the vessel's timbers and were made to resemble the floors of the ship. 18 lbs. of tea could be hidden under the cape or petticoat trouser worn by the fishermen and pilots of the vessels. Cotton bags made into the shape of the crown of a hat, a cotton waistcoat, and a cotton bustle and thigh pieces carried in all 30lbs. of tea. Tobacco, another taxed commodity, was valuable contraband. Made into ropes of two strands, it was coiled with the real rope in the lugger, and was even put into a special compartment in casks of imported bones which were used for manufacturing glue. The wooden fenders slung over the sides of a ship were hollowed out and filled with tobacco. Islands. This room was heated to 90 degrees and he despatched large quantities of leaf tobacco to the depot. After it had dried out, the tobacco was tightly packed into barrels and then imported to England. He paid the duty on the dried tobacco, thus tobacco weighing 100 lbs. could, by drying, be reduced to 60 lbs. It was then taken to a factory, unpacked, and exposed to the air, and regained its original weight. A handsome profit was made by the manufacturer. Later, a law was passed imposing duty on tobacco "according to the quantity of moisture contained therein". Since the rate was higher if the tobacco was dried, then there was no point in the tobacco being dry. Spirits, both brandy and gin, had intriguing journeys into our ports. Brandy was chiefly imported from France. Excellent cognac was shipped from Roscoff. Gin, popular with the troops who had taken part in the Dutch wars, was imported from the Low Countries. Flushing exported gin chiefly to the East Coast. Brandy or gin tubs, roped singly or in pairs and anchored with sinking stones, could be cut off easily and left with markers if Revenue Cutters were in sight. Tubs of spirits were packed into the hollowed keels of boats, hidden under false bottoms, or fitted into rafts or punts which were floated on a flood tide to persons waiting on the shore. In his book on Boldre, in the New Forest, Mr. Frank Perkins tells about smugglers at Pitts Deep, Boldre, Hampshire. "The kegs of spirits, roped together, were sunk and marked with a float, about one quarter of a mile from the shore, in the Pitts Deep stream, at a spot known as Brandy Hole. The kegs were floated ashore by punts, as by this way it was easier to sink them if a coastguard arrived. The kegs were carried from the shore by a gang of local men to carts which were waiting a short distance away, but if dangerous for the carts to load up, the kegs were easily slung across the shoulders, generally one in front and two behind. The pay was 2/ 6d. per keg." Not only were women useful to the smugglers as signallers and carriers of messages from members of the gang to each other, but they actually brought goods in from the shore for them. The voluminous skirt was a particularly useful fashion, for the women wound yards of silk and lace round their bodies and reached home as a rule quite peacefully with their contraband. There have been cases, however, when women have, on inspection, been found to have had their petticoats puffed out by bladders filled with spirits. "A woman of the name of Maclane, residing at Gosport, accustomed to supply the crew of Queen Charlotte with slops went out in a wherry to Spithead, when a sudden squall coming on, the boat sank; the watermen were drowned, but the life of the woman was providentially saved, by being buoyed up with a quantity of bladders, which had been secreted round her for the purpose of smuggling liquor into the ship, until she was picked up by the boat of a transport lying near." A case of being buoyed up by good spirits no doubt! 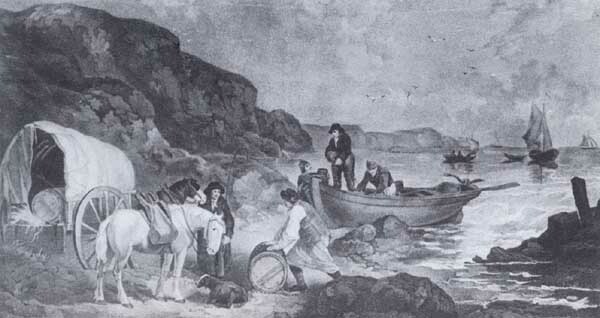 "The articles generally smuggled from this part of the coast are chiefly brandy, rum and geneva, to which may be added a small quantity of wine, tobacco and salt, the whole from the islands of Guernsey and Alderney, which are imported in casks containing from four to six gallons each in vessels from ten to thirty tons burthen in the winter, and in the summer season in boats from three to eight or nine tons carrying three hundred and fifty casks, which are generally sunk on rafts till a convenient opportunity offers for taking them up, which they put into boats and distribute them along the coast at Portland and on the beach called Chiswell Beach as far west as Burton Hive, which is about sixteen miles in extent. It then gets into the hands of women and others, who disperse it in small quantities in the country for five or six miles round, and what is not got rid of in this manner is conveyed on horses forty or fifty miles up the country; but when from tempestuous weather the smugglers cannot sink their goods, they then work to the eastward of that island and sink and disperse it in like manner. The practice of sinking tubs (as the small casks of spirits were now known) became far more common during the Napoleonic wars, from which we must conclude that the preventive forces had at least become sufficiently effective to force the smugglers to adopt a little more secrecy than had previously been employed. As early as 1804 the Weymouth collector stated that casks were "generally sunk on rafts till a convenient opportunity offers for taking them up", and in 1813 the Poole officers provided more details of the sinking method. "The manner in which the contraband trade is at present carried on, we learn, is for the importing craft to sink their goods according to a previous arrangement at different and distant places on the coast without the necessity of any communication on the shore. The goods being in a manner secure by being thus sunk, the smuggler, proceeding by land, acquaints the owners of the marks by which they may find their respective goods. The means by which the landing is effected is small open boats, usually employed during the day in fishing, which at night are hauled upon the beach, frequently immediately contiguous to the spot where contraband goods are sunk. These afford considerable facility to the smuggler, who thereby is enabled to suit his own convenience in landing his goods, which (availing himself of opportunity) he may effect in a single hour without previously creating the least suspicion. It therefore is not surprising that small quantities are introduced into the country in spite of every exertion and vigilance of the preventive officers. The number of casks usually landed in this manner is from twenty to forty and are with inconceivable promptitude conveyed to and concealed in caves (or as they are demanded by the smugglers' sellers) situated in the vicinity of the spot where the landing takes place. These caves or cellars are formed with so much secrecy or ingenuity that their detection amounts almost to a matter of impossibility. They are known to be capable of containing from two to five hundred casks. On the North Shore, where heretofore was a good and principal resort for smugglers, we cannot learn that any goods at all have been worked. Two casks have been taken but these, we apprehend, were part of a quantity sunk to the westward and broke up in a gale of wind." In his book on Dorset smuggling in the 18th and 19th Century ("Smuggling in Hampshire & Dorset"), Geoffrey Morley talks of the old Dove Inn in Burton Bradstock (sadly now closed) which was a depot for contraband. In 1804, Weymouth Customs believed that casks were sunk on rafts between Portland and Burton Hive beach. In 1822 coastguard boatmen William Forward and Timothy Tollerway saw two boats being rowed towards Burton beach, from which whistling signals came. Three smugglers were confronted, who ran away, dropping their tubs. There were often fights between smugglers and coast-guards, and those unlucky enough to be caught and imprisoned, ended up at Dorchester Gaol (Roger - Guttridge adds that the prison was known as St Peter's Palace). THE YEARS IMMEDIATELY following the Napoleonic wars saw a considerable strengthening of the preventive forces all around the British coast. The clampdown had begun in 1805, with the attempt to eliminate the Channel Islands as a contraband trading centre, and had continued in 1809 when the government, concerned at the help the smugglers were giving the emperor, introduced a new force, the Preventive Waterguard, to support the existing services. It consisted of a large number of cruisers and boats under the command of naval officers, whose duty was to patrol the coastal areas while revenue cruisers sailed further out to sea and riding officers guarded the land. But it was the ending of the Napoleonic wars in 1815 which brought about the biggest changes. The long-awaited peace led to the demobilisation of three hundred thousand soldiers and sailors, many of whom had no other trade or occupation in which to channel their energies. The Lords Commissioners to the Treasury accurately predicted that "after so long a period of war in every part of Europe, many of the most daring professional men, discharged from their occupation and averse to the daily labour of agricultural or mechanical employment, will be the ready instruments of those desperate persons who have a little capital, and are hardy enough to engage in this [smuggling] traffic". Although there were more potential smugglers around, there were also more soldiers, sailors and preventive men to combat them. Over the next few years, a whole series of measures were taken to increase the numbers of those employed in the prevention of smuggling and to improve co-operation between them. The Waterguard was reorganised into thirty-one districts, each under the command of a naval officer or a former revenue cruiser commander, and these districts were subdivided into one hundred and fifty-one stations each manned by a chief officer, chief boatman and boatmen. Inspecting officers were appointed to visit both Waterguard and riding officers and combined operations were arranged between the various lines of defence to improve efficiency. Naval vessels and troops of soldiers were also drafted in to aid the struggle. The coasts of Kent and Sussex were given special protection in 1817 with the establishment of the coast blockade, but this was not extended as far as Dorset. However, in 1822 the preventive services were given a further overhaul. The Waterguard, revenue cruisers and riding officers were amalgamated under the control of the Board of Customs and given a new collective name, the Coastguard. Terraces of cottages to house the Coastguard officers were built at strategic spots all along the coast, at Lyme Regis, Chideock, Burton Bradstock, Bridport, Abbotsbury, Kimmeridge, St. Albans Head, Swanage, Studland, Brownsea and Bourne Bottom. All officers and Persons employed in the Coast Guard, are to bear in mind that the sole object of their appointment is the Protection of the Revenue: and that their utmost endeavours are therefore to be used to prevent the landing of uncustomed goods, and to seize all persons, vessels, boats, cattle, and carriages, in any way employed in Smuggling and all goods liable to be forfeited by law. Every Person in the Coast Guard is to consider it his first and most important object to secure the person of the Smuggler; and the reward granted for each smuggler convicted, or the share of the penalty recovered from him, will be paid (on the Certificate of the Inspecting Commander) to the person or persons by whom the smuggler is absolutely taken and secured, and not to the crew in general. Charles Warne, in "Ancient Dorset", 1872, states that an Act of Parliament made the lighting of fires along the coast as a signal to homeward bound smuggling craft, was a punishable offence and Thomas Hardy, in "The Distracted Preacher", has Lizzy Newberry at new moon light a bush on the cliff, to warn the smugglers that the "Preventive-men knew where the tubs were to be landed". She expected they would then sink the tubs, strung to a stray-line at sea, to be later raised by a "creeper", a grapnel. "The fishing interest seems to have slipped away with the dwellings at Seatown. Some say the fish have left the coast but others (with whom I agree) that in the old days the fishermen lived more by smuggling than by fishing. They were a hardy lot, and the son of one of them, himself engaged in the trade as a youth, recalls the smuggling yarns that he, as a little boy, used to hear them tell and the adventures in which he later took part. There were wild rushes to the West Rocks (beneath Golden Cap) when a boat-load of spirits was being rowed ashore from a ship lying out at sea, each man readily shouldering his share of the load - two small kegs - and scrambling off as fast as his legs would carry him. He would find his own way inland to a safe retreat. Cranborne Chase, being a wild, uninhabited district, and the central moors of Dorset, were favourite hiding places." There was a rumpus on the beach at Seatown in 1824, when Chideock coastguards Joseph Davy and John Rigler tried to seize a smuggling vessel, the Fancy, from Seaton in Devon as she was setting off from the beach. Davy managed to make a technical seizure by marking the boat with a broad arrow but was then set upon by Robert and William Foss, two of the smugglers. Robert Foss held up his fist to Davy and shouted: "Damn your eyes! This shall be the worst day's work you ever did in your life." William Foss then grabbed Davy by the collar, demanded to know what business he had in seizing the boat and held him until a team of horses, which the officer wanted to use to drag the boat back up the beach, had been removed from the scene. The mill at Chideock had a secret room under the floor of miller James Gerrard's living quarters. It was discovered by the village riding officer, Samuel Dawson, when he searched the premises in 1820, and there he found two casks of brandy and two of geneva. Gerrard was not the most considerate of millers and tried to put the blame on his servant boy, Samuel Long alias Dido. He claimed Dido was "in the habit of going down to the beach to fetch tubs continually", and that a day or two earlier, he had said to him: "That's a really good place to hide tubs, master. The officers will never find them there". Gerrard's story fell flat, however, when it was learned that upon hearing of the discovery, his brother, Anthony, who also lived in the house, "went away into the country" and disappeared for a while. Dawson and Excise man Samuel Hall discovered another secret room at nearby Whitchurch Canonicorum two years later. They were searching the home of a suspected tub-carrier, John Wakely, and noticed a new partition in one of the upper rooms. If there was any smuggling at all in south-west Dorset, the preventive officers could be sure to find it at Burton Bradstock for this had long been a noted contraband centre and official fears of a great revival in the trade there after the peace in 1815 were well-judged. Here and at Swyre, two or three miles to the east, the Northovers had a finger in every tub and provided regular employment for the keeper of Dorchester Gaol. There was a violent clash on the beach at Burton in December 1822 and inevitably at least one Northover, James the younger, of Litton Cheney, was involved. He was supposed to have struck an officer with a stone but was later acquitted at Dorchester Assizes. The incident began between nine and ten in the evening, when Coastguard boatmen saw two boats being rowed towards the shore and heard whistling, which they took to be a signal to someone on the shore. Three or four men came down the beach and one was heard to say: "Go further east." The coastguards, William Forward and Timothy Tollerway, crept along the beach and came face to face with three smugglers, who dropped the tubs from their backs and ran off. Their comrades were less cooperative. Leaving Tollerway to look after the discarded goods, Forward crept on and seized another dozen or so tubs, then fired his pistol to summon assistance. At this, the remaining smugglers converged on Forward, held his arms to prevent his firing again and dragged him to the water's edge. He called for help and Tollerway fired his pistol, but before other officers arrived, fighting broke out and several smugglers were wounded, though they still managed to escape with all but two of the tubs. Only Northover and sixty-four-year-old William Churchill, of Puncknowle, were detained and the latter spent fourteen months in Dorchester prison for smuggling and assault. The Northovers of Swyre and Litton Cheney were anxious to maintain the traditions established by their forefathers. 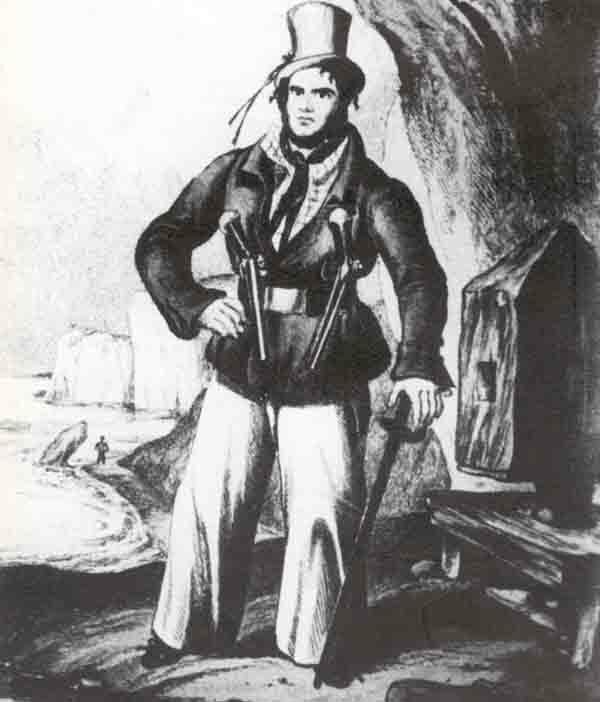 They and other smugglers threatened coastguards from Bridport with sticks and bludgeons when a landing at Swyre was interrupted in 1825. James Northover threatened to kill the chief boatman if he came any closer, but the officer was undaunted and gave chase. One smuggler escaped by jumping over a hedge, the others by scrambling over a stone wall. The officer was about to climb the wall himself when Joseph Northover let fly with his fists and delivered a blow which "rendered him insensible for a short time". The smugglers got away but John Thorne alias Thorner was later imprisoned for obstructing the officers. The Northovers were convicted but not imprisoned, although James twice visited the county gaol and was impressed into the navy for another offence in 1827. The notes of the Rev. Goddard date the last run at Chideock as late as 1882. It was led by the sixty-nine-year-old veteran smuggler Sam Bartlett and began with the customary exchange of signals with the French vessel hovering off the coast. All was well as the Chideock smugglers put off from Seatown in a boat to collect their tubs. But the transfer took longer than expected and they knew the Coastguard patrol would now be in position. After delaying awhile, the boat approached the shore at Eype's Mouth, where other smugglers were waiting. There was a mishap, with one man falling down the cliff and colliding with another, scarring him for life. A few tubs were landed but then the patrol was spotted and the alarm raised. The smugglers decided to open a tub rather than risk having it seized, but one of them drank so much that he died an extremely merry death. The boat put to sea again and sank the tubs off Seatown. Months passed before another opportunity presented itself. This time an attempt was made at Burton Bradstock, but the surf was running high and no boat could go in or out. A few tubs were landed, and removed through a potato field by waggon, but half the original cargo remained at sea. Another landing was attempted below Thorncombe Beacon, but the preventive men were alerted, the boat's tackle got hitched and the tubs were dumped back in the sea once more. Some days passed before the tubs were raised again. This time the chosen spot was the sluices of Bridport Harbour. A few more tubs were put ashore but then the preventives intervened and once more the boat put to sea. Eventually it made its way to Abbotsbury where, at last, the final part of the cargo was landed. So ended Chideock's last run and, almost certainly, the last significant run of good French brandy into Dorset. It had taken six months, three sinkings and five attempts at landing. Earlier generations of smugglers must have been writhing in their graves in shame as the last of their breed dithered and dallied and ferried their tubs hither and thither, desperate to avoid contact with the revenue men. "What matter if the gobblers were about? Could they not be bribed with a keg or two, or beaten into submission, or shot out of existence?" It has been suggested that local ghost stories were encouraged by smugglers as a cover up for nocturnal activities, for example, a headless dog which crosses the road at Catholes. Also, a coach with four headless horsemen and horses between Burton Bradstock and Shipton Gorge at mid-night. Could it be that these were smugglers stories to keep people off the roads at night, or are there really ghosts in Burton Bradstock? There was, until 1912, a coastguard station in the hamlet of Seatown to the west of Bridport Harbour. The old people of the area have said that some old smugglers' cottages fell into the sea due to the slipping away of the coast. The fishermen-smugglers who lived there were 'a hardy lot' they say. From West Bay, the chief route of the free-traders would appear to have been "through Powerstock and Hooke, then over Toller Down". At Toller Down there was an inn much frequented by the smugglers called The Jolly Sailor. The ruins of the inn may still be there. Throughout his life, John Rattenbury earned his living on the sea, sometimes as a fisherman, sometimes as a pilot, occasionally as a merchant seaman, but mostly as a smuggler. As a smuggler he became so notorious that an enterprising Sidmouth printer prevailed upon him to relate some of his adventures for a book. The result was Memoirs of a Smuggler, published in 1837. It was a slim volume which gave contemporary readers tantalising glimpses of smuggling activities in the West Country in the first four decades of the 19th Century. But glimpses were all they could be. Writing within a year of his last acknowledged venture, Rattenbury had to protect the identifies of former associates, some of whom were still smuggling, and therefore said little about smuggling activities in which he was not directly involved. He is virtually silent about the methods used to transport the contraband inland after it had been landed, and about the places it was hidden. The effect is a narrative which frustrates through omission. My aim in producing this publication is to offer the modern reader more than Rattenbury does, and you will therefore find on these pages not only his sketchy canvas but much of the detail and colour he left out. Rattenbury lived in Beer so the emphasis is on that village and its environs, but he travelled far during his lifetime. His voyages as a youth - some of them aboard privateers took him as far south as Portugal and the Azores, as far east as Gothenburg, and as far west as New York and Newfoundland. As a smuggler Rattenbury conveyed contraband from the Channel Islands and Cherbourg, and was intimate with the coast from Portsmouth and the Isle of Wight to Falmouth. At the peak of his career his operations were variously centred around Weymouth and Portland, Lyme, Seaton and Beer, Sidmouth, and Dartmouth; and he had skirmishes with customs men and press gangs in places as far apart as Cowes, Bridport, Newton Abbot, Dawlish, Teignmouth and Falmouth. His escapades were many, avoiding a prison sentence in Bodmin jail only by escaping on his way there. Rattenbury's smuggling boat was a three-masted lugger called Brothers, built in Beer in 1807. The official owner was Abraham Mutter, a Burton Bradstock shipwright. She was captured by two Cowes cutters on 11 May 1808 with 135 small casks of spirits aboard. A report at Cowes gives the captain of the Swallow as Amos, and the Captain of the Stork as Ferris. Brothers was condemned for illicit trading. Its registration was cancelled on 28 March 1809 and it was broken up at Cowes. The reward for Amos and Ferris - their moiety on the sale of the spirits and the boat's materials - came to £71 each. "At the beginning of 1814 trade was extremely dull because of fluctuating nature of our public affairs. Smuggling was also at a standstill. However, I was always on the look-out because I had a large family, so when I heard that Mr Downe**, a gentleman then residing at Bridport, wanted a person to rig a vessel and go fishing for him, I immediately went to see him and offered to undertake the job. He made some enquiries, found that I was capable of doing it, and agreed to employ myself and my son (William, then 12) on very liberal terms. We went to Bridport where we were engaged in this work from February till the end of April, when the vessel was ready for sea. Mr. Downe then paid myself and my son at the rate of 27 shillings per week for our joint labour, and discharged our bill at the public-house where we had lodged during the whole time we were employed on it. We went fishing in the vessel until July, and were paid by the share. We found, however, that this speculation would not answer because Bridport was an inconvenient place to go in and out at. 0ur employer ordered the vessel to be laid up, and we went home again. This engagement proved a great relief to my circumstances for, as I said, every other kind of trade was very dead." **In the second half of the 18th Century, the Downes were one of the leading families in Bridport. William Downe 1744-1820, was the most notable, being both a ship-owner in Bridport and a merchant in London where he had a wharf. In about 1789, he built in Bridport a replica of his London home, calling it Downe Hall. 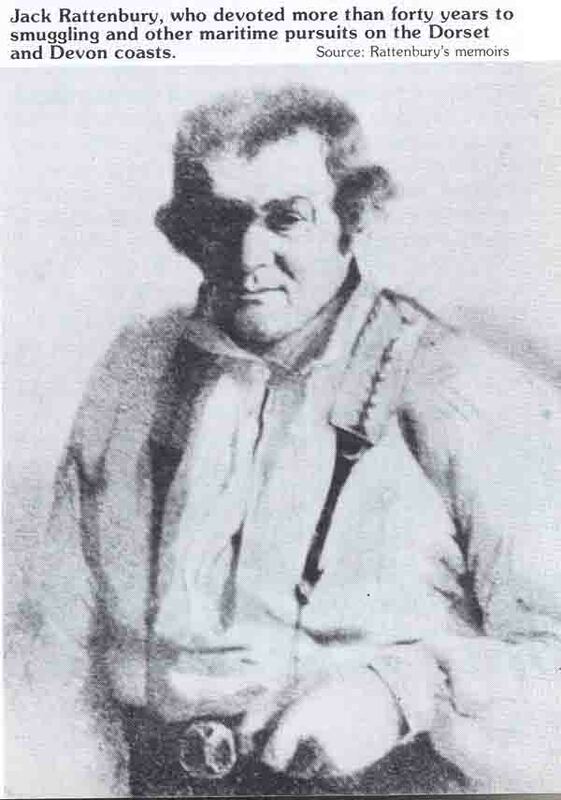 A Nathaniel Downe was bailiff of Bridport several times between 1807 and 1816. Unfortunately there are no clues in Rattenbury's narrative as to which Downe it was that hired him and his son to go fishing. Smugglers used the Dove Inn at Burton Bradstock as a rendezvous, and Isaac Gulliver himself probably drank in the pub, since in 1776 he bought Eggardon Hill, a prehistoric earthwork a little way inland, specifically to guide his ships to the coast. Isaac Gulliver junior, the uncrowned king of Wiltshire and Dorset smugglers, was born in true Moonraker country, at Semington, Wiltshire, in 1745. 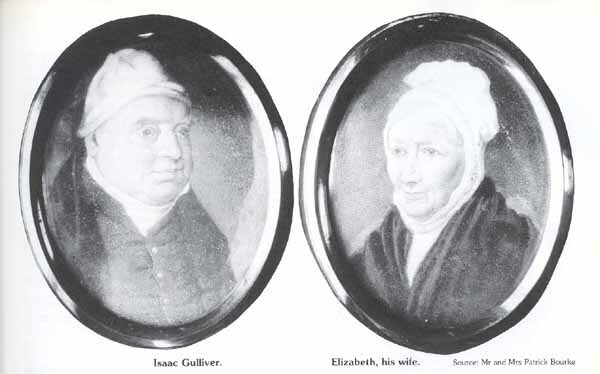 He is described in the Semington baptism register as the son of Isaac and Elizabeth Gulliver, though his father seems to have had doubts on the matter, describing him in his will made in 1765 as "my son or reputed son Isaac Gulliver, otherwise Matravers". Little is known of his early life but it is apparent that he grew into a man with both brawn and brains, an invaluable combination for a smuggler. Someone who saw him at Wimborne during the last years of his life described him as having Herculean proportions but with a countenance which, despite his advanced age, still indicated great determination of character. Even the Customs officers had to admit (in 1788) that he was a person of "great speculating genius". 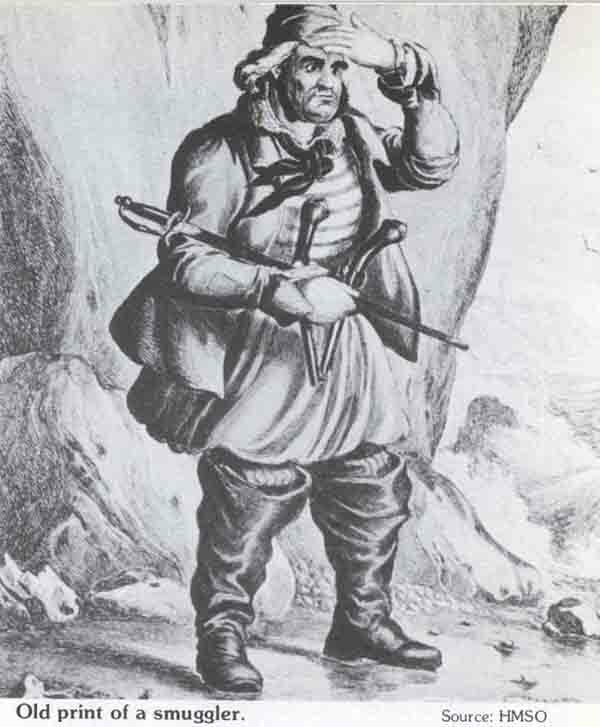 It is a fair assumption that Gulliver had an early baptism into the smuggling trade and it was probably his travels in that connection which brought him into contact with the people of Cranborne Chase, a noted haunt of smugglers and rogues of every kind. Presumably this was also how he met Elizabeth Beale, whom he married at Sixpenny Handley parish church on October 5, 1768. Gulliver's principal historian, Vic Adams of Blandford, believed Elizabeth was the daughter of William Beale, who kept the Blacksmith's Arms at Thorney Down, on the Blandford to Salisbury road, then one of the main contraband transportation routes. Soon after his marriage, Gulliver himself took over the pub and changed its name to the King's Arms. In William Beale, he had probably found not only a father-in-law and fellow innkeeper but also a partner in crime. "A smuggler named Gulliver kept forty or fifty men constantly employed who wore a kind of livery, powdered hair, and smock frocks, from which they attained the name of 'White Wigs'. These men kept together and would not allow a few officers to take what they were carrying when the law was altered and seizures made from weaker parties. Gulliver amassed a large fortune and lived to a good old age. Till of late years, a chamber open towards the sea at the mouth of the River Lyme, was in existence, where the White Wigs took refreshment and remained in waiting until their services were required. This was about one hundred yards from the Custom House." Isaac Gulliver was regarded by Customs officers as "one of the greatest and most notorious smugglers in the West of England and particularly in the spirits and tea trade". Not only was he a speculative genius: he was also a master in the art of keeping one step ahead of the law and it was his proud boast that no revenue officer had ever suffered physical harm at the hands of men under his command. He preferred subtle methods. Thus, while other smugglers risked prosecution by signalling with fire from the coastal clifftops, Gulliver bought one of Dorset's highest points, Eggardon Hill, ten miles west of Dorchester, five miles inland and more than eight hundred feet above sea level, and created there a small plantation of trees to serve as a landmark to smuggling ships. The trees are supposed to have been cut down by order of the government but traces still remain of the octagonal bank and ditch built by Gulliver to protect his saplings from the winds which swept across the hill. 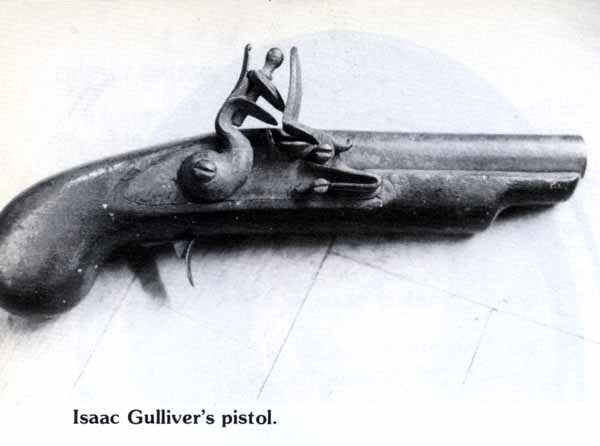 To Isaac Gulliver, the best method of secrecy was openness, like selling wines and spirits from a shop, like posing as a corpse in an open coffin and, according to another legend, like disguising himself as a shepherd and spending a whole day in Wimborne Market under the noses of the Excise men who were seeking to arrest him. In 1782 he threw all his cards on the table and took advantage of the government's offer to pardon smugglers who agreed either to serve in the navy themselves or to provide two substitutes to serve for them. Gulliver would have had, no difficulty in finding the funds necessary to buy the services of a couple of volunteers. According to the Poole Customs officials who may or may not have been telling the whole truth, if indeed they knew it - Gulliver gave up smuggling tea and spirits after 1782 and concentrated on wine, which they appear to have regarded less seriously. 3) The Colonel of Bridport. For a considerable time a successful gang of free-traders, under the leadership of a man called the 'Colonel', operated along the coast from Seatown to Charmouth. Their chief landing ground was St. Gabriel's Mouth. Much of the contraband was delivered locally and the Church Tower was used as a hiding place in an emergency, but the free traders usually worked their way across Marshwood Vale to inland market towns. However, even the Colonel had his problems - there is a tale of how one of his organised landings came unstuck and the very large cargo had to be sunk to avoid discovery by the Authorities. This cargo later floated ashore all along the coastline at Eype's Mouth, Burton Bradstock, West Bay and Abbotsbury, much to the joy of the local villagers. Legend says that the Colonel's gang was so successful they solicited orders in advance from their customers, and supplied many local Bridport Inns on a regular basis. Put the brushwood back again - and they'll be gone next day! If the lining's wet and warm - don't you ask no more! Don't you tell where no-one is, nor yet where no-one's been! SUGG, Mordecai, 1728, 2 gals. brandy or strong waters, seized from his house, the Full Moon. PENISHIN, William, 1741, 48 lbs tea from his warehouse. ROSE, John the younger, 1735, 5 3/4 lbs tea from his house. RUSSEL, George, 1728, 7 gals. brandy or strong waters. SYMES, Henry, 1735, 2 gals. rum from his house. SYMES, John, 1735,1 gal. rum. LAKE, Philip, 1724, 9 gals. brandy from his house; 1725, 5gals. brandy at Lyme. COSSENS, Samuel, tailor. 1 cask and 1 jug brandy and 1 cask French wine from his house. ROPER, Richard, 1725, 15 gals. brandy. STEPHENS, Anthony, 1725, 2 bottles brandy, 1 gray mare, saddle, bridle & sack bag. ROPER, Simon, 1730, 3 ½ gals. brandy from a cave in his mow barton. (Details, where known, are given in following order: Name, trade, year of arrival in prison, age; crime; verdict/sentence, etc. (e.g. fine and prison sentence served in default of payment); miscellaneous. The registers also contain certain other details, such as physical characteristics which are not given here unless of exceptional interest). HURDEN, James, sailor, 1817, 31; smuggling; £100, 3 1/2 months. BLANCHARD, Moses, labourer, 1823, 46; smuggling; £100, 9 months. BOATSWAIN, William, fisherman, 1825, 18; smuggling; £100. 6 months. 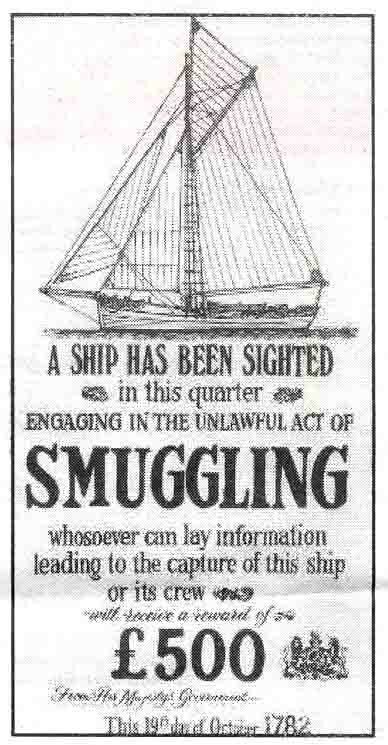 1833, 25; smuggling; £100, 1 year. FERRY, Thomas, fisherman, 1825, 19; smuggling; £100, 6 months. COUSINS, Moses, basket maker, 1832, 23; smuggling; £100, 2 months. CREW, John, labourer, 1834, 29; Assaulting & obstructing Customs officers; death, reprieved, hard labour 1 year (served 2 years). HALL, John, labourer, 1834, 21; (as John Crew). GEE, Martha, fisherwoman, 1839, 58; smuggling; 9 months hard labour, served 3 months. GEE, John, labourer, 1840, 50, smuggling; 6 months. ANGELL, Henry, fisherman, 1841, 66; smuggling; 6 months. ROPER, William, labourer, 1843, 52 smuggling; 6 months. BAKER, Ann, needle woman, 1830, 32; smuggling; £12.10s., 2 months. RUTLEDGE, Levia, twine spinner, 1820, 60; smuggling; £23 10s. 5d., 3 months; blind widow. POWELL, William, shoemaker, 1821, 26; smuggling; £46 13s. 2d,, 5 1/2 months; discharged on account of His Majesty's Coronation. HOUNSELL, Ruth, shoe thread winder, 1823, 45; smuggling; £50, 5 months. GERARD, William, labourer, 1823, 50; smuggling; £50, 5 months. SYMES, Susan, shoe thread winder, 1824, 46; smuggling; £26, 6 months. BISHOP, Seth, labourer, 1824, 37; smuggling; £26, 6 months. MARSH, Sam, shoemaker, 1824, 31; smuggling; £26, 6 months. SHEPPICK, Richard, sailcloth weaver, 1842, 42; smuggling; 1 month. STROUD, Joan, twine spinner, 1824, 50; smuggling; £50. GROVES, John, labourer, 1816, 32; making a light and fire as a signal to person or persons in smuggling vessel; 6 month's hard labour. COOMBS, William, labourer, 1821, 41; smuggling; £100, 9 months. BUCKLER, Mathew, shoemaker, 1826, 26; smuggling; £100, 8 months. WOODCOCK, John, flax comber, 1836, 24; obstructing Customs officers; 7 months hard labour. WOODCOCK, Robert, fisherman, 1836, 47; (as John Woodcock). WILLIAMS, James, fisherman, 1836, 40, obstructing Customs officers; 6 months 'hard labour. PARSONS, Thomas, fisherman, 1836, 21; (as James Williams). GERRARD, George, labourer, 1836, 23; (as James Williams). BEST, James, baker, 1836, 60, (as James Williams). CHURCHILL, Willam, labourer, I822, 25; unlawfully making a light on the sea coast: acquitted, 1823, 26 smuggling; 3 months hard labour and £50 security to keep peace for 5 years. CHURCHILL, William, labourer, 1822, 64, smuggling, £100, 14 months. 1823, 64; assaulting Customs officers, guilty, remanded to Court at King's Bench for sentence, 8 months. HANSFORD, Thomas, labourer, 1823, 23; smuggling; £100, 1 year. SEAL, Henry, labourer, 1834, 21; smuggling and obstructing Customs officers; bailed and acquitted after 6 months. NORTHOVER, Henry, fisherman, 1839, 23; smuggling; 6 months. PRIOR, Richard, labourer, 1835, 34; smuggling; 6 months. 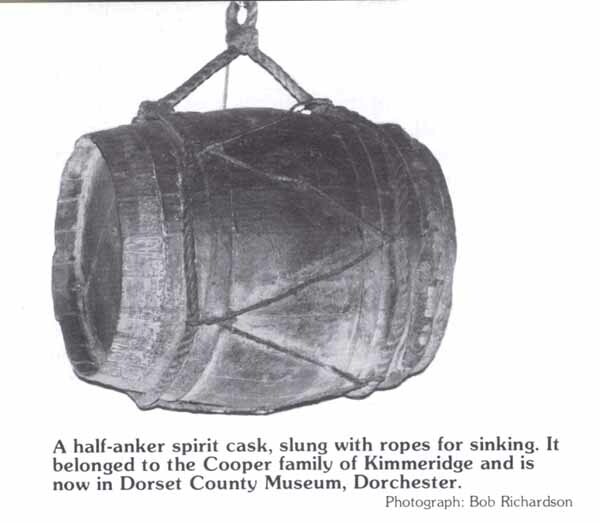 ANKER: cask usually holding about 8½ gallons, but sometimes varying from 6 1/2 to 9 gallons. BARQUE: vessel with fore and main masts square-rigged, mizen fore-and-aft rigged. BARQUENTINE: vessel like a barque but with only foremast square-rigged. BAT: stout pole, usually of ash and about six feet long, used as weapon by smugglers. BATMAN: smuggler armed with a bat to defend contraband; the batsmen of cricket may owe something to the smugglers. BILL OF LADING: shipmaster's detailed receipt to consignor of a cargo. BOATMAN: member of a Customs boat crew. BORFA: an inferior grade of black tea. BOOK OF RATES: official list of duties on commodities. BRIGANTINE: square-rigged vessel with two masts. CAR VEL-BUILT VESSEL: vessel built with planks laid edge to edge to increase speed. CLINKER-BUILT VESSEL: vessel built with overlapping planks for extra strength at the expense of speed. 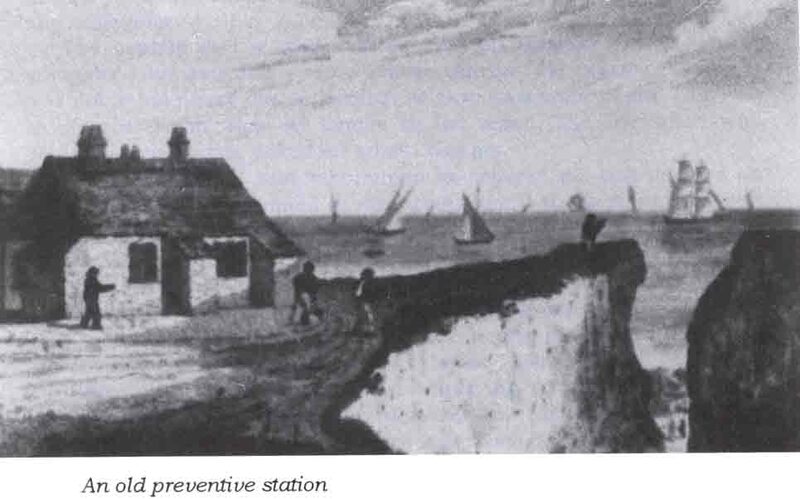 COASTGUARD: service introduced in 1822 initially to combat smuggling. COAST WAITER: officer attending the shipping and landing of all goods conveyed from one part of the British coast to another. COLLECTOR OF CUSTOMS: chief officer of a port, responsible for recording details of all imports, exports and seizures and for supervising other officers. COMPOSITION: a fine for smuggling, calculated according to value of goods seized and the smuggler s means. COMPTROLLER: officer subordinate to collector, responsible for checking collector's accounts and forwarding a copy to Comptroller General. COUNTRY: district; county; rural hinterland. COUNTRY PEOPLE: people, especially smugglers, from the rural hinterland. CREEPING: dragging the sea-bed to recover contraband. CREEPING IRONS: grappling irons or hooks used for creeping up sunken casks. CREEPING UP: see Creeping and Creeping irons. CUSTOMER: Customs officer originally appointed when the collection of duties was farmed out, to send a copy of the collector's accounts to the Treasury. By 1782, it was considered an "obsolete and sinecure office" which ''ought to be abolished". CUSTOMS DUTY: tax on goods being imported or exported. 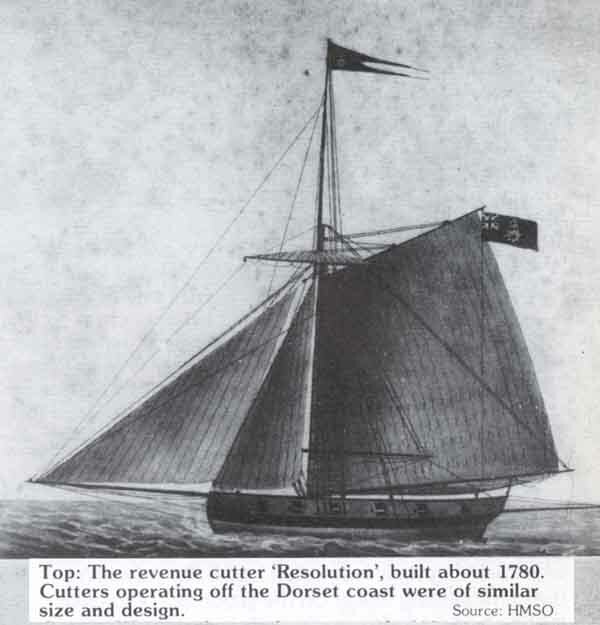 CUTTER: small single-masted sharp-built broad vessel. DARKS: moonless nights, ideal for smuggling. DEBENTURES: certificates acknowledging that a refund of duty is due on imported goods to be re-exported. DONKEY: single-legged stool used by coastguards; forerunner of the shooting stick. DOWLAS: a coarse linen or cotton cloth. DRAGGER BOATS: definition uncertain; possibly boats used for dragging or dredging sea-bed for oysters; also medieval word for boats used for criminal purposes. DRAGOON: mounted soldier, armed with carbine and sword. DRAWBACK: refund of Excise duty. DRY GOODS: non-liquid contraband, especially tea. DUFFER: unmounted contraband carrier who could carry up to 1 cwt. of tea or tobacco hidden in the lining of his coat. EXCISE DUTY: tax on goods produced and sold within the country. EXTRAMAN: tidewaiter or boatman hired on a casual basis. FREE-TRADER: smuggler's name for himself. FREIGHTER: person responsible for buying contraband abroad. GALLEY: large open boat propelled by oars, sometimes with a sail. GAUGER: revenue officer who measured or "gauged" barrels and other containers. GENEVA: a spirit flavoured with juniper berries; gin. GOBBLER: smuggler's name for revenue official. GROAT: a silver coin, originally the 4c1. piece of Edward I, issued 1279-1662. GUINEABOAT: a fast galley, used for carrying guineas to France. HAGBOAT: type of 18th century merchant vessel with a beak-head and hull-planking which continued around the stern. 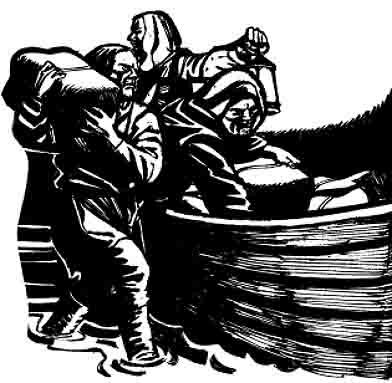 HALF-ANKER: cask holding about 4 gallons; the favourite size of later generations of smugglers. HIDE: place for concealing contraband. HIGGLING CART: cart of a hawker or peddler of small merchandise. HOGSHEAD: cask holding about 54 gallons. HOT: mixture of gin and brandy served warm; a favourite tipple of smugglers. HOY: vessel, usually sloop-rigged, used for fishing or coastal trading. HYSON: a green tea from China. KETCH: vessel rigged fore-and-aft on two masts. LANDSHARKS: smuggler's name for land-based revenue officers. LAND SURVEYOR: Customs officer in charge of landwaiters. LANDGUARD: collective name for Customs riding officers. LANDWAITER: Customs officer responsible for recording quantity and quality of all imported goods on landing. LUGGER: two- or three-masted vessel with four-cornered sails set fore-and-aft. MILITIA: non-professional military force, employed when needed. OCTOBER: the strongest beer, brewed in the month of October. PACKET: vessel carrying mail and passengers. PIPE: wine cask holding 105 gallons. PRIVATEER: privately owned ship, armed, and licensed by government to capture enemy vessels. RHENISH: wine from the Rhine valley. RIDING OFFICER: mounted Customs officer, first appointed 1699, to patrol in search of smugglers and hidden or abandoned contraband. SCHOONER: fore-and-aft-rigged vessel with foremast shorter than mainmast. SEARCHER: Customs officer appointed to issue certificates for goods entitled to drawback (refund of duty); office usually converted to a sinecure ,by appointment of a deputy. SITTER: officer in charge of a Customs boat crew. SMACK: vessel similar to a cutter, used for carrying merchandise or passengers. SMOUCH: smuggler's name for elder and ash leaves shredded t'6 resemble tea and sold as such. SOOSEY: a type of cloth. SOUCHONG: a type of black tea from India or Ceylon. 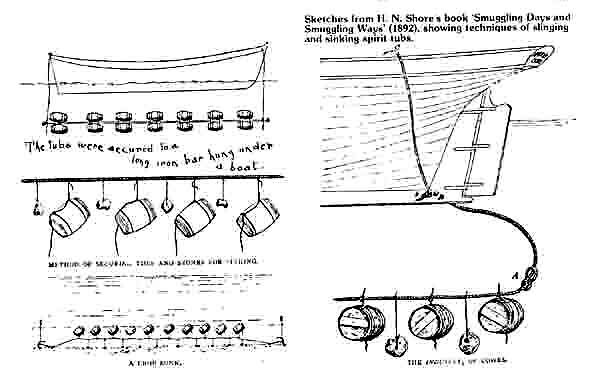 SOWING THE CROP: the practice of sinking casks in the sea with weights and markers. SPOTSMAN: member of smuggling crew responsible for choosing safest landing place. STINKIBUS: foul-smelling spirits which have gone off after prolonged submersion in the sea. SUPERVISOR OF EXCISE: officer in charge of Excise officers in a particular area. SUPERVISOR OF RIDING OFFICERS: Customs officer in charge of several riding officers. SURVEYOR: supervising officer of a Customs district. TIDE SURVEYOR: supervisor of tidewaiters, responsible for rummaging ships arriving in port to see that no goods are concealed for clandestine landing. TIDEWAITER: Customs officer responsible for searching ships arriving in port to ensure that no goods are concealed for running as contraband. TIERCE: a provision cask equalling one-third of a pipe. TUB-BOAT: boat used for smuggling small casks. 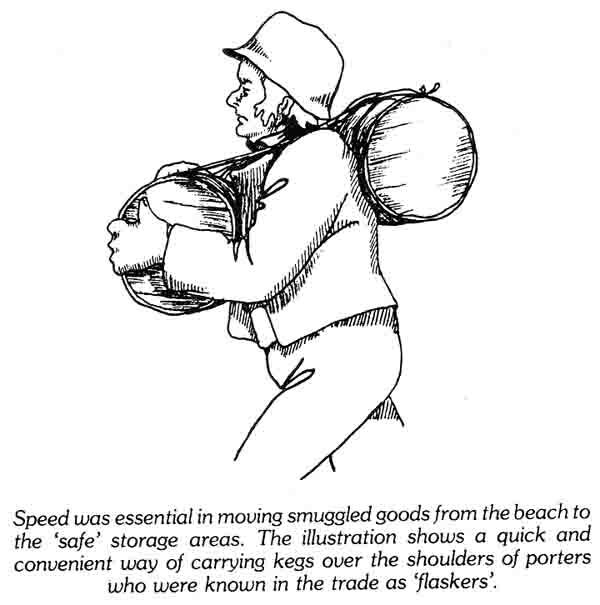 TUBMAN: smuggler employed to carry small casks. ULLAGED CASK: cask only partly full. VENTURE: an investment in a run of contraband. WATERGUARD: collective name for Customs men operating at sea. WEIGHER: a labourer or porter employed to unpack and weigh goods for landwaiters, searchers and coast-waiters. WORKING THE CROP: the practice of recovering sunken casks. Weymouth was the centre of preventive operations for the area, but from custom house correspondence it would seem that the smugglers were not strongly opposed: at the end of the 17th century, the collector of customs at Weymouth was described in an official report in terms far from glowing. He had...'a debauched life and conversation, seldom sober, and hardly ever goes to bed till three or four a clock in the morning and many times not all night.' The customs officers of Portland were little help: of one was said he 'never did any service, but rather the contrary'. Other staff seem to have included the halt and the lame: an official appointed in 1719 was 'an old man...[who] cannot see anything at a distance'. The failings and corruption of the Weymouth officials had historic origins: even in the early 16th century the ironically named George Whelplay had difficulty making any progress against concerted local support for smuggling. He was originally a London Haberdasher, but he contrived to make considerable sums of money by becoming a public informer. As such he was entitled to half of the fine levied on people caught as a result of his actions. Since smuggling amounted to a national pastime, this did not make him a popular man. He overstepped the mark in 1538, incurring the wrath not only of the crooked merchants, but also of the customs officials themselves. He had uncovered a plan to illegally export horses to France, and had intercepted the cargo. However, he was also aware that 3 French ships were at anchor in Weymouth harbour, ready to set sail with contraband on board. Whelplay had tried to enlist the help of local officials in rounding up the three French boats, but far from assisting, the controller, searcher and deputy customer joined a gang of merchants to set about the informer. It appears he didn't learn his lessons easily-soon afterwards he tried again to intercept 200 horses bound for France. This time he was beaten with bills, swords and staves, again by customs officials among others. However, it has to be said that the witness was 'much in Liquor' when reporting the drowning. In another incident a customs house officer was murdered at the 16th century Black Dog Inn in the town, while trying to arrest a smuggler who had taken refuge there. For God will soon avenge my fate. Weymouth smugglers had the unique advantage of Chesil Beach, and the Fleet--the lagoon behind. This extraordinary bank of shingle stretches unbroken nearly 17 miles, from Burton Bradstock to Portland. Smugglers landing on the beach in the pitch black of a moonless night were able to judge their position to within a mile or two by simply picking up a handful of shingle, and gauging the average size of the stones. At the Portland end, the pebbles are the size of potatoes, and then progressively slim down to pea-shingle on the beach at Burton Bradstock. If they were lucky, the customs officials suffered only insults. In 1822 a storm loosened a raft of tubs, which floated free, and a race between the revenue and the tubs' owners ensued, to see who could reach the contraband first. The revenue boat was in the lead, but the smugglers raised a sail, and surged ahead. As they passed, the helmsman dropped his trousers, 'striking his posterior in derision' at the downcast revenue men. Abbotsbury boasts a dramatic chapel on the hill-top--a fine navigational marker--and the local smuggling HQ was the Ilchester Arms, once the Ship Inn. In 1737, evidence of the Abbotsbury group's activities came to light at Bexington, on the Swyre road, where 3/4 ton of tea was found under hedges, along with brandy, rum, silk, cotton, and handkerchiefs. Smugglers used the Dove Inn at Burton Bradstock as a rendezvous, and Isaac Gulliver himself probably drank in the pub, since in 1776  he bought Eggardon Hill, a prehistoric earthwork a little way inland, specifically to guide his ships to the coast. To make it more prominent...'The small enclosure [on top] was prepared for a plantation to serve as a local mark for vessels engaged in the contraband trade. ' (The revenue men cut them down). The hill is impressive: it rises suddenly at the end of a long, flat plain, and a series of concentric trenches and embankments spiral around its circumference. From the top, it is possible on a clear day to look out over the sea some five miles away, and the hill gives a good view over all the surrounding countryside. In Shipston Gorge, Gulliver's Lane runs down from the Hill. The Chideock smugglers landed goods between Charmouth and Seatown, and marked the hills above their favoured landfalls as Gulliver marked Eggardon Hill--with copses of trees. These grew at Charmouth, Seatown, Eype's Mouth and Stanton St Gabriel. The miller at Chideock hid his share of the contraband in a secret room under the floor of his living accommodation at the mill. When the revenue men found four tubs of spirits there in 1820, the cowardly miller tried to blame his servant Dido, saying the boy had told him several days earlier that the cellar was 'a really good place to hide tubs, master. The officers will never find them there'. According to legend, the principal route taken by contraband was up the river Buddle where the buildings crowd in  but the truth is more prosaic--most contraband was probably just sneaked in under the noses of the preventives, who were frequently understaffed, and handicapped by ludicrous local bylaws about where their jurisdiction ended: cargoes unloaded on the Cobb--the town pier--could not be inspected until they had been carried half a mile to the Cobb gate. However, when caught red-handed, the Lyme smugglers were as resourceful as the next man. A tub carrier who ran into a senior official of the custom house reputedly exchanged warm greetings and put the tubs down at the officer's feet, telling him 'The excise man axed me to take these two tubs to you, and gied me two shillings for the job; but damn him! If I had know'd they'd be so heavy, and would ha' cut my shoulder so, I'd seed unto the devil afore I'd ha' touched o'em'. Whether or not the officer believed the story is unclear, but unable to carry the tubs himself, he eventually gave the man a further florin to carry them back to the custom house, and strode off to await their arrival while the tub carrier 'rested'. As soon as the officer rounded the corner, the man's exhaustion left him, and he effortlessly shouldered his burden and made off.